Have you ever wanted your tattoo gun to be picked out by a professional? Well, the Professional Tattoo Kit 4 Machine Guns by G4 is a kit that has been customized from experienced tattoo artists and their suggestions. Knowing that what your getting is worth of a professional tattoo artist experience as well as easy to use and a great quality is what you will get with this professional tattoo set. What is Inside the Tattoo Machine Kit? 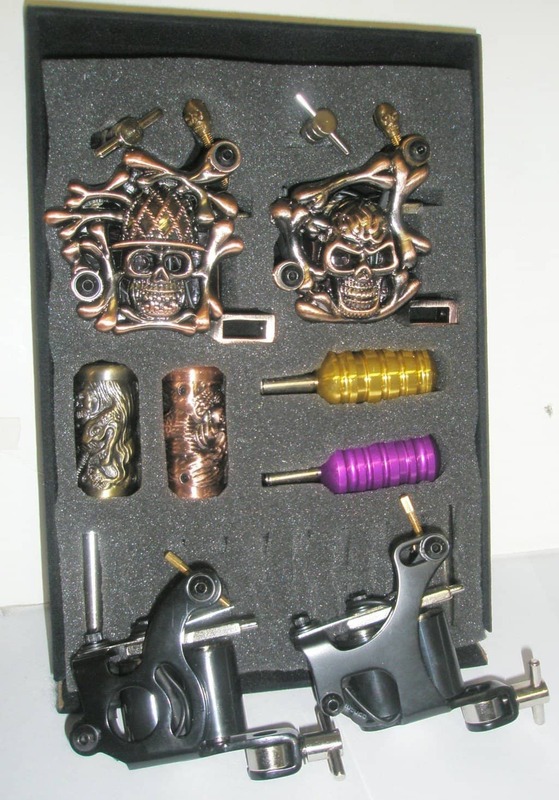 The professional Tattoo Kit 4 Machine Guns comes with many components that you might not find in other tattoo kits. You will find in the kit four tattoo guns, power supply, disposable tips, 50 disposable needles, 8 inks from Iron Sakura (color and blacks), practicing leather sheet and a CD tutoring guide. The kit is mailed to you in a black aluminum case. This case holds everything in, and it comes with a lock and two keys. This can help you secure your new tattoo kit when you are not using it. The four tattoo guns that are come with the kit are designed for a liner as well as a shader (Layer Warp Coils). They come equipped with 45 cooper threads that are strung into a silicone insulated gun power cord. This design offers flexibility as well as being a very good conductor. 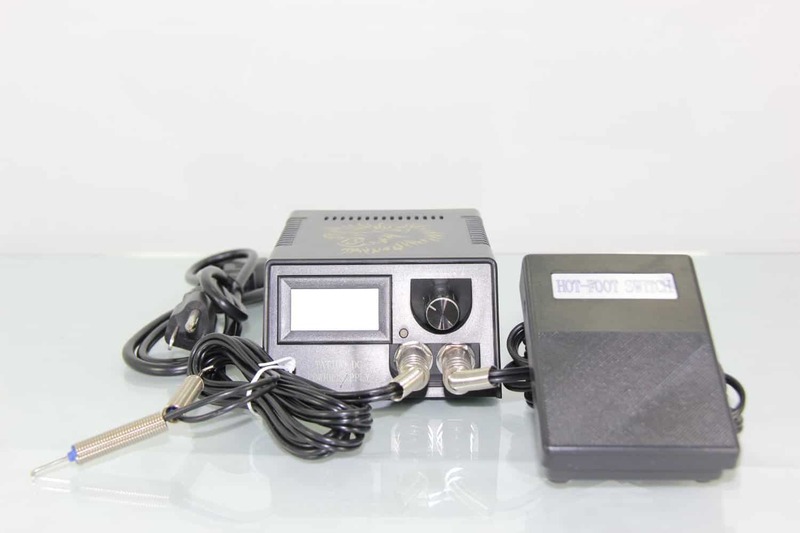 The guns in the Professional Tattoo Kit 4 Machine Guns has the ability to be enjoyable to the seasoned tattoo artist as well as simple for the beginner to learn as well the tattoo artist work. The guns come with eight E.O. gas sterilised needles. Four of them are round tips and the other four are magnum tips. The Professional Tattoo Kit 4 Machine Guns kit comes with a UL listed power supply set. It is digital and operates at either the 110V or 220 V. It has an output of 2Vdc up to 20Vcd .It comes with a foot petal that is great to use. The power supply box can be touchy sometimes; however, it works as well as some of the expensive professional ones. This Professional Tattoo Kit with 4 Machine Guns comes with iron Sakura base inks. The kit comes with eight bottles of ink, two of the bottles are black and it also comes with six other colors. The inks are great in great quality to begin with, however, there is not a lot in the 10ml bottles so plan on purchasing more once you get into tattooing. The set comes with many accessories beyond the absolutely needed things. You will receive two tool kits, 50 cushion rings and rubber bands, 50 disposable needles, printing transfer oils, a four pack of ointments. You will also receive two practice leather sheets with designs on them that can help the beginner learn about the tattooing. The Professional Tattoo Kit 4 Machine Guns is a kit that is well worth the price (just about the 50$). It got great tattoo supplies and accessories and will provide fun for those who are interested in furthering their career or just learning a new hobby. To summarise, this kit is good for everyone, one of our more recommended tattoo kits for sale suitable both for amateurs and more advanced artists.